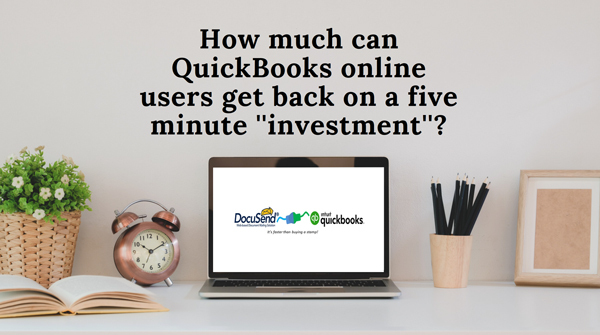 How much can QuickBooks online users get back on a five minute ''investment''? Forward-thinking businesses recognize a relationship with the right third party can provide distinct advantages over their competitors. But it's a risk to invest the time or resources researching services that may not pay off in the end. What if the ''investment'' was no more than five minutes? That would change everything, right? That's all it takes to use the free DocuSend mailing app from the Intuit App Store to send out your first mailing. Think about the time spent printing and mailing your company's invoices every month. It varies, but on average, businesses spend up to four hours just to print, fold, stuff, and apply postage to a few hundred invoices. But with the DocuSend app, once the five minute ''investment'' to use the app for the first time is done, going forward, your entire billing process will only take a few minutes to complete each time you use it. The reason the DocuSend app saves you so much time is it lets you distribute documents from your desk while maintaining or improving output quality. It increases your overall production by eliminating the manual hours you have to regularly pull away from your normal business responsibilities. And since there are no minimum order quantities with DocuSend, cash flow is improved by simply increasing the frequency in which invoices are sent. Instead of waiting until month end to process invoices, you can quickly send them as soon as you’ve completed the work. Why is your ''investment'' only five minutes? There are no long-term contracts to read, no hidden charges to worry about, and no minimum quantity requirements. Try it once and see why DocuSend has over a 95% retention rate. Use it regularly and watch your “investment” thrive by saving you hours of monotonous, time consuming, menial labor month after month. It's simply the easiest and most cost-effective document distribution system in existence today. Give five minutes of your time and see for yourself. If you are a QuickBooks desktop user, or if you use any other accounting software, don't worry—just upload your files directly to the DocuSend website. And in addition to invoices, use DocuSend for billing statements, estimates, letters, tax documents, legal forms and more—it’s like having your own mailroom in the cloud! It's faster than buying a stamp!